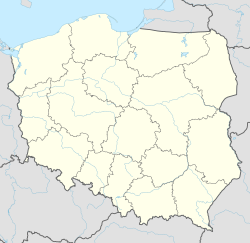 Jedlińsk [ˈjɛdliɲsk] is a town in Radom County, Masovian Voivodeship, in east-central Poland. It is the seat of the gmina (administrative district) called Gmina Jedlińsk. It lies in historic Lesser Poland, approximately 14 kilometres (9 mi) north of Radom and 79 km (49 mi) south of Warsaw along the E77 Highway. The village has an approximate population of 1,700. Jedlińsk gained town privileges in 1530. These were revoked in 1869, while it was part of Russian-controlled Congress Poland. Its name comes from pine trees (Polish: jodly), which were abundant in the area in the Middle Ages. Jedlińsk was granted town charter in the year 1530, upon an order of King Sigismund I the Old. At that time, it belonged to the Jedliński family (Nabram coat of arms), and in the second half of the 16th century, Jedlińsk emerged as one of centers of the Protestant Reformation in northern Lesser Poland. The town had a Calvinist prayer house, together with a school, which competed with the famous Racovian Academy (see also Polish Brethren). The school existed in 1560-1630, and in that period, Jedlińsk attracted many Scottish Calvinists, who founded a bell for the prayer house (the bell still exists). In 1630 - 1669, Jedlińsk belonged to the Witowski family, and was part of Sandomierz Voivodeship. The town was destroyed in the Swedish invasion of Poland, and never recovered from the destruction. Furthermore, it changed hands several times in the 18th century, belonging to a number of families. In 1794, Tadeusz Kosciuszko stayed here for a short time, on his way towards Warsaw. After the Partitions of Poland, Jedlińsk shortly belonged to the Habsburg Empire, and on June 11, 1809, a battle between Polish Army and the Austrians took place here, during the Polish–Austrian War. In 1815 - 1915, Jedlińsk belonged to Russian-controlled Congress Poland, and the Russians stripped it of the town charter in 1869, as a punishment for the January Uprising. In 1890, the village burned in a fire. Jedlińsk has a parish church, which was destroyed by the Swedes in 1655, and remodelled in 1752. This page was last edited on 21 February 2019, at 13:17 (UTC).